More than 500,000 bone graft procedures are performed in the US each year and approximately 2.2 million worldwide.1 The estimated cost of these procedures approaches $2.5 billion per year. Either autograft or allograft tissue is used in 90% of procedures. The current standard is for autograft tissue bone grafts, in which tissue is harvested from the patient, usually from the iliac crest, but possibly from the distal femur or the proximal tibia. The graft is then placed at the injury site. This tissue is ideal as a bone graft because it possesses all of the characteristics necessary for new bone growth—namely, osteoconductivity, osteogenicity, and osteoinductivity. Osteoconductivity refers to the situation in which the graft supports the attachment of new osteoblasts and osteoprogenitor cells, providing an interconnected structure through which new cells can migrate and new vessels can form. Osteogenicity refers to the situation when the osteoblasts that are at the site of new bone formation are able to produce minerals to calcify the collagen matrix that forms the substrate for new bone. Osteoinductivity refers to the ability of a graft to induce nondifferentiated stem cells or osteoprogenitor cells to differentiate into osteoblasts. Harvesting the autograft requires an additional surgery at the donor site that can result in its own complications, such as inflammation, infection, and chronic pain that occasionally outlasts the pain of the original surgical procedure. Quantities of bone tissue that can be harvested are also limited, thus creating a supply problem. Allografts are alternatives to autografts and are taken from donors or cadavers, circumventing some of the shortcomings of autografts by eliminating donor-site morbidity and issues of limited supply. However, allografts present risks as well; although allograft tissue is treated by tissue freezing, freeze-drying, gamma irradiation, electron beam radiation, ethylene oxide, etc, the risk of disease transmission from donor to recipient is not completely removed. Some have estimated that the risk of human immunodeficiency virus (HIV) transmission alone with allograft bone is 1 case in 1.6 million population.2 A case of hepatitis B transmission and 3 cases of hepatitis C transmission have been reported with allograft tissue. More recently, cases of disease transmission have been reported. Although rigorous donor screenings and tissue treatments have greatly reduced the incidence of HIV and hepatitis transmission, other diseases have been passed on as recently as 2000 and 2001. In April 2000, 2 different patients received bone-tendon-bone allografts for anterior cruciate ligament reconstruction from a common donor. Each patient developed septic arthritis from the donor tissue.5 In November 2001, a patient underwent reconstructive knee surgery, and within 4 days of the surgery, the patient died of infection caused by Clostridium sordellii.6 After these and similar cases were reported, the CDC began an investigation that revealed 25 other cases of allograft-related infection or illness.6 Although many methods can reduce the risk of disease transmission, the treatments used to sterilize the tissue remove proteins and factors, reducing or eliminating the osteoinductivity of the tissue. Despite the benefits of autografts and allografts, the limitations of each have necessitated the pursuit of alternatives. Using the 2 basic criteria of a successful graft, osteoconduction and osteoinduction, investigators have developed several alternatives, some of which are available for clinical use and others of which are still in the developmental stage. Many of these alternatives use a variety of materials, including natural and synthetic polymers, ceramics, and composites, whereas others have incorporated factor- and cell-based strategies that are used either alone or in combination with other materials. This article reviews what is currently available and what is on the horizon. Allograft-based bone graft substitutes involve allograft bone, used alone or in combination with other materials (eg, Allogro [AlloSource, Centennial, Colo], Opteform [Exactech, Inc, Gainesville, Fla], Grafton [BioHorizons, Birmingham, Ala], OrthoBlast [IsoTis OrthoBiologics, Irvine, Calif]). Factor-based bone graft substitutes are natural and recombinant growth factors, used alone or in combination with other materials such as transforming growth factor-beta (TGF-beta), platelet-derived growth factor (PDGF), fibroblast growth factor (FGF), and bone morphogenetic protein (BMP). Cell-based bone graft substitutes use cells to generate new tissue alone or are seeded onto a support matrix (eg, mesenchymal stem cells). Ceramic-based bone graft substitutes include calcium phosphate, calcium sulfate, and bioglass used alone or in combination (eg, OsteoGraf [DENTSPLY Friadent CeraMed, Lakewood, Colo], Norian SRS [Synthes, Inc, West Chester, Pa], ProOsteon [Interpore Cross International, Irvine, Calif], Osteoset [Wright Medical Technology, Inc, Arlington, Tenn]). Polymer-based bone graft substitutes, degradable and nondegradable polymers, are used alone or in combination with other materials (eg, Cortoss [Orthovita, Inc, Malvern, Pa], open porosity polylactic acid polymer [OPLA], Immix [Osteobiologics, Inc, San Antonio, Tex]). The use of allografts for bone repair often requires the sterilization and deactivation of proteins normally found in healthy bone. Contained in the extracellular matrix of bone tissue are the full cocktail of bone growth factors, proteins, and other bioactive materials necessary for osteoinduction and, ultimately, successful bone healing. To capitalize on this cocktail of proteins, the desired factors and proteins are removed from the mineralized tissue by using a demineralizing agent such as hydrochloric acid. The mineral content of the bone is degraded, and the osteoinductive agents remain in a demineralized bone matrix (DBM). Allogro (AlloSource) is demineralized bone matrix. (A) DynaGraft (IsoTis OrthoBiologics) is a mixture of demineralized bone matrix (DBM) and a reverse-phase polymer and forms a solid matrix, putty, or injectable paste. (B) OrthoBlast (IsoTis OrthoBiologics) is the same polymer mixed with cancellous bone chips and DBM to create a formable paste. DBM has been incorporated into several products currently on the market. Allogro is a DBM product (see Image 1). AlloMatrix (Wright Medical Technology, Inc) is Allogro combined with calcium sulfate; this paste can be formed into an onlay or injected directly into a defect site. DynaGraft II (IsoTis OrthoBiologics) is DBM mixed with a temperature-sensitive polymer and forms a solid, putty, or injectable paste, depending on the composition (seeImage 2). 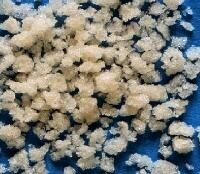 OrthoBlast is DBM mixed with the same polymer and cancellous bone chips and is also available as a putty or a paste. The factors and proteins that exist in bone are responsible for regulating cellular activity. Growth factors bind to receptors on cell surfaces, stimulating the intracellular environment to act. Generally, this activity translates to a protein kinase that induces a series of events resulting in the transcription of messenger ribonucleic acid (mRNA) and, ultimately, into the formation of a protein to be used intracellularly or extracellularly. The combination and simultaneous activity of many factors result in the controlled production and resorption of bone. These factors, residing in the extracellular matrix of bone, include TGF-beta, insulinlike growth factors I and II, PDGF, FGF, and BMPs.12,7 Researchers have been able to isolate and, in some cases, synthesize these factors. Much work continues in the research setting, and some products for clinical use have appeared on the market. With current techniques, in vitro differentiation of mesenchymal stem cells toward the osteoblast lineage is possible. Stem cells are cultured in the presence of various additives such as dexamethasone, ascorbic acid, and β-glycerophosphate to direct the undifferentiated cell toward the osteoblast lineage. The addition of TGF-beta and BMP-2, BMP-4, and BMP-7 to the culture media can also influence the stem cells toward the osteogenic lineage. In research laboratories, marrow cells containing mesenchymal stem cells have been combined with porous ceramics and implanted into rat and canine critical segmental defects, with bony growth occurring as quickly as 2 months. Mesenchymal stem cells have also been seeded onto bioactive ceramics conditioned to induce differentiation to osteoblasts. These have been proposed for use in bone repair prosthetic coatings. Calcium sulfate is also known as plaster of Paris. It is biocompatible, bioactive, and resorbable after 30-60 days. Significant loss of its mechanical properties occurs upon its degradation; therefore, it is a questionable choice for load-bearing applications. Osteoset is a tablet for use for defect packing. It is degraded in approximately 60 days (see Image 3). AlloMatrix is Osteoset combined with DBM. It forms a putty or injectable paste (see Image 3). Osteoset (left) and Allomatrix (right) are produced by Wright Medical Technology, Inc. Osteoset is a calcium sulfate tablet used for bone defect sites, whereas Allomatrix is a combination of calcium sulfate and demineralized bone matrix that forms an injectable paste or a formable putty. Bioactive glass (bioglass) is a biologically active silicate-based glass.Its high modulus and brittle nature make its applications limited, but it has been used in combination with polymethylmethacrylate to form bioactive bone cement and with metal implants as a coating to form a calcium-deficient carbonated calcium phosphate layer. This layer facilitates the chemical bonding of the implant to surrounding bone. Products include Biogran (developed by Orthovita and licensed to 3i, Implant Innovations, Inc, Palm Beach Gardens, Fla) and PerioGlas (NovaBone Products, LLC, Alachua, Fla). Calcium phosphates account for most of the ceramic-based bone graft substitutes currently available. Several types of calcium phosphates exist, including tricalcium phosphate, synthetic hydroxyapatite, and coralline hydroxyapatite, and are available in pastes, putties, solid matrices, and granules. Such calcium phosphate products include Bio-Oss (Geistlich Biomaterials, Inc, Baden Baden, Germany) and OsteoGraf (see Image 4). Both products use hydroxyapatite, either as a particulate (Bio-Oss) or as blocks and particulates (OsteoGraf). Vitoss (Orthovita, Inc) is a tricalcium phosphate available as a solid piece, putties, or pastes. ProOsteon is a unique product based on sea coral, which is converted from calcium carbonate to calcium hydroxyapatite. The advantage of this material is that the structure of the coral, which is similar to that of trabecular bone, is maintained. However, like many of the solid calcium phosphates, ProOsteon is brittle and not suitable for use in load-bearing sites (see Image 5). OsteoGraf (DENTSPLY Friadent CeraMed) uses hydroxyapatite as bone graft material in either a block or a particulate form. ProOsteon (Interpore Cross International, Inc) is produced from hydroxyapatite in either a particulate or a block form by chemically treating sea coral. Image courtesy of Interpore Cross International, Inc. The final group of bone graft substitutes is the polymer-based group. Polymers present some options that the other groups do not. For example, many polymers that are potential candidates for bone graft substitutes represent different physical, mechanical, and chemical properties. The polymers used today can be loosely divided into natural polymers and synthetic polymers. These, in turn, can be divided further into degradable and nondegradable types. Healos (DePuy Orthopaedics, Inc, Warsaw, Ind) is a natural polymer-based product, a polymer-ceramic composite consisting of collagen fibers coated with hydroxyapatite and indicated for spinal fusions. Cortoss is an injectable resin-based product with applications for load-bearing sites. Rhakoss (Orthovita, Inc) is a resin composite available as a solid product in various forms for spinal applications (see Image 6). Polymer-based bone graft substitutes include both particulate and solid forms such as Cortoss and Rhakoss, both produced by Orthovita, Inc.
Degradable synthetic polymers, like natural polymers, are resorbed by the body. The benefit of having the implant resorbed by the body is that the body is able to heal itself completely without remaining foreign bodies. To this end, companies have used degradable polymers such as polylactic acid and poly(lactic-co-glycolic acid) as stand-alone devices and as extenders to autografts and allografts. 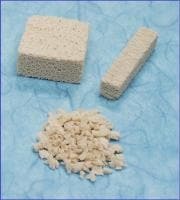 BoneTec, Inc (Toronto, Canada) has developed a porous poly(lactic-co-glycolic acid) foam matrix by using a particulate leaching process to induce porosity. Immix Extenders (Osteobiologics, Inc), a particulate poly(lactic-co-glycolic acid) product, is used as a graft extender (see Image 7). Degradable polymers allow for complete healing because the matrix is completely resorbed by the body. Osteobiologics, Inc, has produced Immix Extenders, a particulate polymer used as a bone graft extender. Despite the many advances in bone graft substitutes, new materials and approaches to bone healing continue to be investigated. One exciting area is tissue engineering, which can be defined as the application of biologic, chemical, and engineering principles to the repair, restoration, or regeneration of living tissues by using biomaterials, cells, and factors, alone or in combination. This basic design has also been combined with a ceramic to form a composite matrix. The strategy behind the composite would allow the benefits of both materials to be included in one design. By using both previously synthesized hydroxyapatite and calcium phosphate synthesized within the matrix itself, the polymer-ceramic composite fosters the mineralization of newly forming bone. A similar polymer-ceramic composite has also been shown to be a viable surface for attachment and factor production of murine stromal cells transfected to produce BMP-7. Many products on the market today fill the need for bone grafts. Several of these products capitalize on the necessities of an ideal substitute: osteoconductivity and osteoinductivity. As more materials are adapted and discovered, preexisting products are finding new applications and effectiveness in combination with newly emerging technology. In addition, as investigators continue to find new materials and biologic approaches to bone repair, the future of bone graft substitutes continues to be an expanding topic. Thank you for sharing such a nice information regarding medical transcription, Medical Transcription Services rising in recent years and there are many fields of medical transcription i.e Orthopedics Transcription, Dermatology Transcription, Geriatrics Transcription,Pediatrics Transcription etc. The biology of bone grafts and their substitutes is appreciated from an understanding of the bone formation processes of Osteogenesis, Osteoinduction and Osteoconduction.